Manchester United striker Romelu Lukaku might not last much longer at Old Trafford if his current form continues, but who could succeed him? The Red Devils are 10th in the Premier League after nine matches of the new season and are struggling to string a sequence of wins together, largely due to the fact that they are severely lacking a spark in the final third of the pitch. Lukaku has led the line for Jose Mourinho’s men since his arrival in 2017 and during his first season he managed to hit 27 goals in all competitions, but that record didn’t tell the full story. While the Belgian is undeniably a handful in full-flow, he can also be incredibly frustrating to watch, lumbering around in the opposition’s half with a clumsy aura which translates in his astoundingly poor ball control and at times incredibly wasteful finishing. The 25-year-old has just four goals to his name in 13 matches so far this term and supporters are becoming increasingly impatient with him, as he has justifiably become the main scapegoat whenever the team fails to secure a positive result, which is all too often in recent times. Mourinho has backed his number one striker publicly, however, he may privately already be drawing up a list of potential replacements with the January transfer window fast approaching and his job very much on the line. Gone are the days when the likes of Robin Van-Persie, Dimitar Berbatov, Wayne Rooney and Ruud Van Nistelrooy tormented defences upfront under the stewardship of Sir Alex Ferguson. 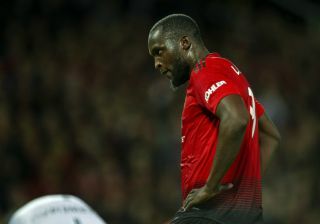 In their place has been a long line of pretenders not fit to wear the shirt or indeed remotely capable of helping to restore the glory days and Lukaku is, unfortunately, falling into that bracket at the moment. Caught Offside has compiled a short list of top European centre-forwards who could be drafted in to take his place and crucially, each one could realistically be tempted away from their current surroundings. First up is one of the Premier League’s most consistent strikers over the last five years and the man who is most directly responsible for solidifying Tottenham’s status as a top four club – Harry Kane. The Englishman has scored over 20 goals in each of his last four seasons for Spurs, winning two Golden Boots in the process, and has already boldly set his sights on breaking Alan Shearer’s all-time league record. At 25 years old there is every chance that we have yet to see the best of Kane, which is a scary thought given his numbers, but is he ready for a big money move? There is a general feeling among experts that he will eventually outgrow Spurs and pursue major trophies with a bigger club, as he has already stated his ambition to reach the level of Cristiano Ronaldo and Lionel Messi one day. A traditional centre-forward in every sense of the word, Kane would be an upgrade on Lukaku and the perfect foil for the likes of Marcus Rashford and Jesse Lingard, both of whom he works with at international level.